In the well known Lord’s Prayer, Jesus uses the term, ”Our Father”, to describe God. Since we all have earthly fathers, the tendency for us is to think of our Heavenly Father’s attributes and character in terms of what we know about our earthly fathers. Our understanding of what an earthly father is influences our understanding of God as our Heavenly Father. We take our understanding of God as a father from our culture or our personal experiences as to what we know a father to be. By doing this we attribute human characteristics to God and in so doing often create a grim authoritarian patriarch or a quick tempered figure who is out of patience and disappointed in our behavior. How does Scripture depict God as, ”Our Father”? Scripture alone should define and tell us what God is like as a father and not our experiences or relationships with our earthly fathers. The Bible neither compares nor likens God to an earthly father. Hosea 11:9 says, ”I am God and not a human being, the Holy One in your midst.” Both the Old and New Testaments are precise and clear as to what they mean when they refer to God as “Father”. Overwhelmingly, when the word, ”Father”, is used as a metaphor for God, it is used as symbol for tenderness and compassion! The title,”Father”, is applied to God sixteen times in the Old Testament. Twelve of those describe God as a father to his people. In seven of those twelve Scriptures, God is described as redeemer, compassionate, tender and merciful (Psalm 68:4-5, Psalm 103:13, Isaiah 63:15-16, Jeremiah 3:4, 19 & 31:9, and Hosea 11:1-9). These seven texts in the Hebrew Testament make it clear that the image of God as a Father was dominated with ideas of compassion, love, tenderness and redemption. However, the premier example of what our Heavenly Father is like is found in Jesus’ own story of the prodigal son, in Luke Ch. 15. The father in this story (a metaphor for God) does things for his sons that we would never expect an earthly father to do. Jesus took the picture of the divine Father found in Hosea 11, added the compassionate female side also found in the Scriptures and then moved it up to another level. Jesus, in His parable, created this remarkable father who is full of tenderness, patience, compassion, love, and a willingness to endure great suffering in order to redeem His children. The next time you say the Lord’s Prayer and you begin with “Our Father which art in Heaven”, see if these truths don’t change the way you pray. P.S. I borrowed heavily for this story from Kenneth Bailey’s book, Jacob & the Prodigal and was where I got the idea to start with. 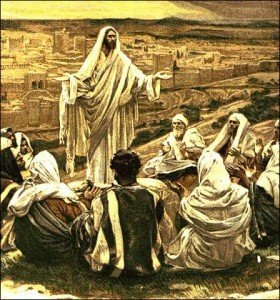 At the beginning of his public ministry, Jesus called twelve disciples to follow and learn from Him. He spent three years teaching them to be just like Him. They followed him twenty-four hours a day, seven days a week, and watched him do everything; from simple, mundane things, to healing sick people and even raising the dead. When the end of this three year training period had ended and Jesus had been crucified and resurrected, His call to His disciples changed. He had finished teaching them to be like Him and now they were ready to go out on their own to spread the gospel that they had witnessed for those three years. And, they went! These eleven former trainees went literally to the ends of the earth to spread the good news about their rabbi. Jesus didn’t spread the gospel; he had his disciples do it! They went to far away, pagan cities such as Ephesus, Pergamum, Collosae, Corinth, Athens, and Rome to carry on the training that they had received from their rabbi. One striking example, that I had never noticed before, that shows how Jesus’ followers tried to be just like their rabbi is found in the book of Acts in the 19th and 20th chapters. 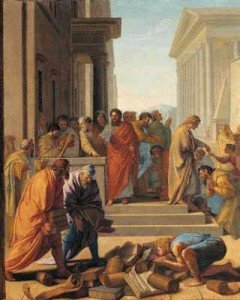 The story is of Paul, in the city of Ephesus, and says in verse 19:7 that Paul had about twelve disciples, and in 20:31 that he taught those disciples for about three years! That is following the outline pretty closely! We don’t often think about why we have Christianity in America in the twenty-first century. It is because of the discipleship training model of Jesus and his disciples’ determination to follow their rabbi’s instructions down to the last jot and tittle. Those eleven men (and women) followers changed the world forever because of their training and their commitment to their rabbi and His message. We are being challenged by Jesus in the same way today. He asks us to follow Him and to go and make disciples. Are you up to the challenge? One of the most fascinating components of the ancient Roman Empire was their unbelievably extensive road system. The Roman Empire built over 57,000 miles of paved roads throughout their conquered lands. These roads connected the Far East and Mesopotamia with Asia Minor, Egypt, Israel and ultimately Rome, itself. Names such as the “Royal Road” and the “Via Maris”which meant the “Way of the Sea”, were given to these ancient super highways. These roads were as wide as our two lane highways of today and were paved with huge limestone rocks that were quarried, then shaped to fit like bricks on the road bed. As the roads came close to each city, they would get wider and they would place columns on each side of the roadway. Shops would be set up among the columns to trade and sell to the travelers coming and going on the road. The Roman engineers even laid sewer channels for the cities by placing them underneath the roadbed and then straddling the channel with large stones to conceal it and make it sturdy. Way stations were placed one days travel apart, along the main roads. These road side inns were called “caravanserai” and catered to the estimated 3 million travelers that traversed these highways on a yearly basis. All the labor was performed by Roman slaves. It has been estimated that almost half the population of the Roman Empire were slaves they had conquered and used to accomplish their building projects. These roads were in place and being built during the time of the New Testament. You can actually walk on some of the same road beds that the apostles walked on as they went to spread the gospel in Asia Minor and other parts of the world. Cities such as Ephesus, Pergamum, Sardis, Collosae and Laodicea were on these roads and they steadily increased in size and commerce because of the traffic on the road. These cities became stopping places for the apostles as they went and spread the good news about Jesus Christ. What is the faith lesson here? When Jesus commanded his disciples in Matthew 28:19-20 and in Acts 1:8 to ”go and make disciples out of all the nations and that he would be with them to the ends of the earth (age)”, He already had the roads in place! One hundred and seventy years before Paul, God began building a road system that would allow the disciples to reach all the known world for Christ. And, they went on those roads literally to the ends of the earth, as far as they could travel! On those main roads, God had set up a ready and accessible congregation in the bigger towns and cities that were intersected by the roads. The apostles must have been convinced by what they saw at the resurrection and ascencion of Christ, because they fearlessly went to these pagan nations to spread the story about the Jewish Messiah. It is over 1,300 miles on foot, which is a 60 -80 day journey, to Ephesus from the Galilee. This was a huge commitment from the disciples to leave their homes and family to go to these far away places. They must have really believed their message and had a passion that is hard for us to grasp. Because of their faithful witness, we have the blessing of Christianity in America today. What is the moral of the story? If God is sending you to Asia Minor, He will already have the roads in place! All you have to do is be willing to walk the path that He has called you to! “Now to Him who is able to do immeasurably more than all we ask or imagine, according to His power that is at work within us” Ephesian 3:20.